Happy Thursday y'all! I hope your week is going well. Last week I shared some of my favorite beauty products when it comes to hair and skin care, you can find that post here. 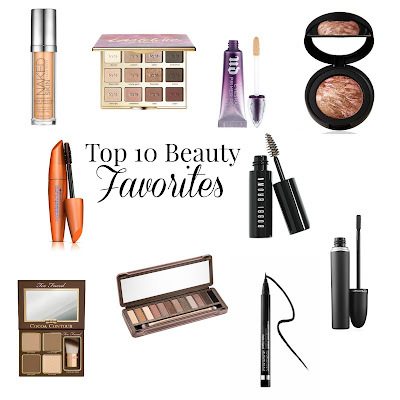 Today I'm sharing ten of my favorite beauty products that I use daily. URBAN DECAY WEIGHTLESS FOUNDATION - I have tried many foundations and this is by far my favorite. It's not oily, has great coverage, and doesn't feel heavy on my skin like most foundations that I've tried. TARTE IN BLOOM PALETTE - I have never found a Tarte eye shadow palette that I didn't love! I love that this palette has both matte and shimmery shades. URBAN DECAY EYE SHADOW PRIMER - Y'all! This stuff is seriously like magic. I usually put my make up on around 5 am, and my eye shadow looks exactly the same at the end of the day after working all day, and going to the gym. LAURA GELLER BAKED BLUSH - I started using this baked blush about a year ago and it's now a fave of mine! It's like a blush/bronzer in one. COVER GIRL LASH BLAST MASCARA - My favorite drug store Mascara. I have been using this mascara since I started wearing makeup back in eighth grade and it works just as good as any high-end brand that I've tried. BOBBI BROWN NATURAL EYEBROW SHAPER - I bought this last year after seeing another blogger recommend it and it quickly became my go-to each day. TOO FACED CONTOUR - I don't contour very often, and I'm definitely not an expert, but when I do contour this is what I use! I love that it comes with a booklet that shows tips on how to contour. URBAN DECAY NAKED 2 PALETTE - This Naked Palette is another on of my faves. I alternate between using it and the Tarte Palette! CLINIQUE PRETTY EASY LIQUID EYELINER - I don't wear eyeliner everyday, but when I do, this is by far my favorite liner to use. MAC UPWARD LASH MASCARA - When it comes to name brand mascaras this one is my fave! I received it as a sample with one of my Nordstrom purchases and loved it so much I bought it after using it just once! 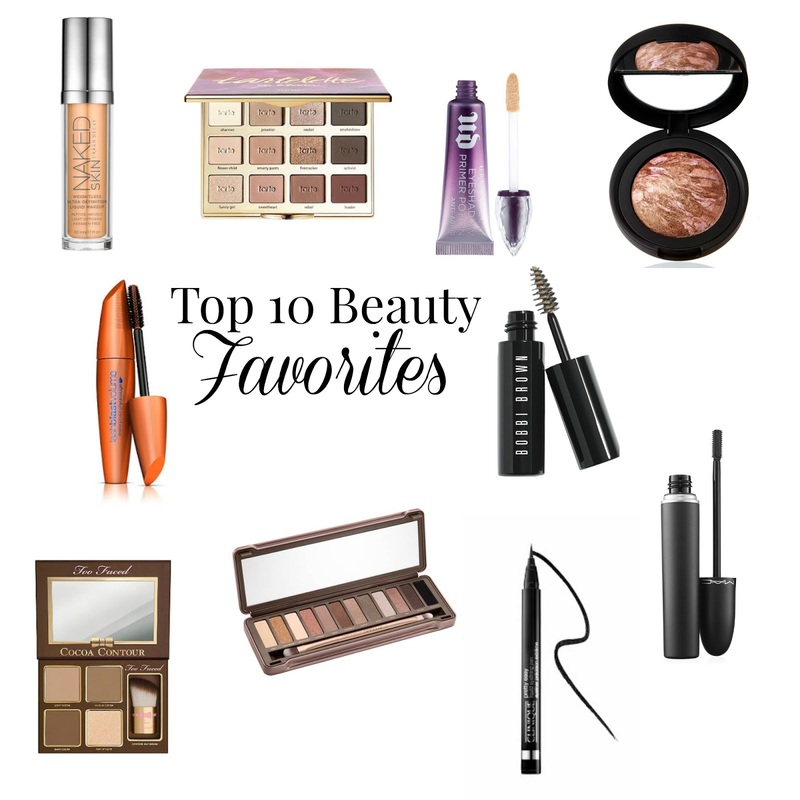 What are some of your favorite beauty products? I would love to know if there is anything I need to add to my makeup bag! I've never used an eye shadow primer, but I might need to start doing that! I've been reading in a lot of blogs about people using eye pencils. I never thought you could tell the difference, but wow their before and after pictures are neat to see! The eyeshadow primer is the best! And maybe I need to check out some of those blogs! I love liquid eyeliner, but it's so hard to apply!